As you may have noticed on my Facebook page, our car broke down this month and it costs more to fix then it would to buy a new one. With this in mind, we have decided to try and manage car-free over summer whilst we save for a new one and I've spent some time trawling the Internet for the best options for us. 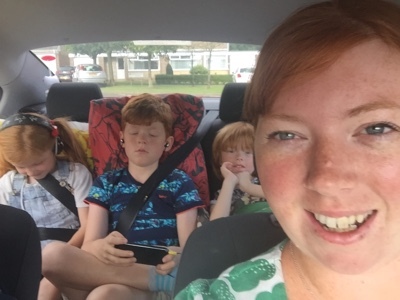 Busy families need four wheels that can get them from A to B quickly and without any hassle when it comes to strapping the kids in and keeping them entertained on the journey. So,which cars on the market are the best options? Hatchbacks are always a great choice when it comes to family cars, small enough to make maneuvers in tight spaces on the school run but with enough boot space to fit the kids' scooters and a picnic basket and the dog at the weekend they’re ideal for busy families on the go. It’s also an affordable car, more so than other hatchbacks on the market and the latest model is 200kg lighter which means it’s better for emissions and fuel costs. This great sized car is fun to drive and is only available in a five door model, which is ideal for families who have to take their time securing the kids in car seats in the back. Ford Focus models are easy to find on the used car market, confirming their popularity and status as dependable family cars and are extremely roomy inside – especially when it comes to boot space. It’s not the cheapest family car on the market due to its popularity but it’s perfect for those looking for a vehicle perfect for weekend motorway drives to days out or comfort on the way to school in the morning. If you’re looking for a stylish family car, then the Octavia doesn’t quite have those credentials but it’s one of the best vehicles on the market for a busy family. The cabin size is vastly bigger than other hatchbacks and there’s plenty of leg room in the back as the little ones grow. Available in a variety of engine sizes, the 1.0-litre petrol version is still powerful enough for city driving and the 1.8-litre is perfect for diverse roads you might need to navigate. For the stylish parents out there, the BMW 1 Series not only looks great but is also surprisingly economical to drive. You can choose between three or five door options, depending on your needs and budget, and while it isn’t the most spacious of the cars on the list it does feature a powerful engine making it perfect for longer trips as a family. The BMW 1 Series features a clever infotainment system in the form of the iDrivefeaturing a host of gadgetry and features designed to make the driving experience easier and more enjoyable – although bear in mind that the sat nav only comes as standard on the 116d ED Plus model. For the busy family, ease of access, comfort, room and economic driving is important when choosing a vehicle which is why you should definitely consider one of the cars listed above, all of which are available to buy outright or lease and enjoy new.